It’s been a super fun Halloween party and your favourite Disney Princesses can’t wait to share their favorite photos with you. Ready discover what costumes they had this Halloween? Then feel free to join the Disney Crew in getting this fun dress up game started to see what they’ve picked for their trick-or-treating session. Oh look girls, they had some adorable animal costumes… care to discover some of the funkiest in their wardrobe? 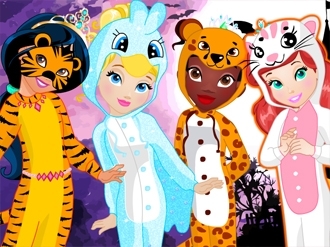 Princess Jasmine, Cinderella, Tiana and Ariel bought the cutest animal costumes this year: from cute fantasy creatures such as unicorns and dragons to sweet bunnies, lions, zebras or cuddly bears you can pick the right Halloween costume for each of your favourite Disney Princess. Complete each selection with a new hairstyle, matching shoes and complementary plush toy! Have a great time playing our brand-new dress up game for girls called ‘Animal Crew Halloween’!